ERIC COLE TROPHY The Eric Cole trophy is awarded to the rider with the biggest improvement in time for 25 miles from one season to the next and is aimed at recognising riders who are improving, not necessarily the fastest overall. To claim this trophy, members should submit details of the events of their fastest 25 mile time trial time from the current season and the fastest time from the previous calendar year. The winner will be the rider whose time has been reduced the most. Previous Season 25TT P.B. 1h:12m:30secs equals improvement of 4 minutes and 7 seconds. *Note-Priority will be given to rides that were all time personal bests at the time of the event. CASTLE TROPHY The Castle Trophy is a handicap competition and uses the club evening time trial series to award points based on a rider’s finishing position. The way the points are allocated gives a beginner or improving rider a good chance of beating the fastest riders. There is no need to claim this trophy and the winner will be informed. Riders can track their progress in the competition by looking here ( Castle points ). A maximum of ten events will count to the overall competition. CHRISTMAS CUP The Christmas Cup is a handicap competition that is awarded to the rider whose overall time minus their handicap time is the fastest. Each riders handicap target time is based on their age and gender, and can be found here. The race is normally held on Boxing day and is rarely won by the fastest rider in the field due to the handicapping system. Under 16 BEST ALL ROUNDER (B.A.R.) To enter this competition you need to submit your three fastest ten mile time trial times during the current season. The winner is the rider with the fastest average speed across all three events and receives the Davidson trophy. UNDER 18 BEST ALL ROUNDER (B.A.R.) As above, but average speed is calculated from the submission of your two fastest ten mile and two fastest twenty five mile time trial times during the current season. UNDER 16 CYCLO CROSS TROPHY This is awarded to the rider who, in the committee’s opinion, has competed most successfully in cyclo cross events during the season. You should submit the events you rode and finishing position, as well as any final league or championship position you achieve. UNDER 18 CYCLO CROSS TROPHY As above but for riders aged 16 or 17 at the time of event. UNDER 16 HILL CLIMB TROPHY This is awarded to the rider with the fastest aggregate time over the two club hill climbs. These events are usually held at the end of the season. SEE ALSO Castle Trophy, Freewheel competion and Eric Cole trophy for competitions that may be of interest to youth riders. AUDAX TROPHY Audax events are non-competetive and often long distance events with the emphasis being on reliability, rather than speed (more information here- Audax UK ) . 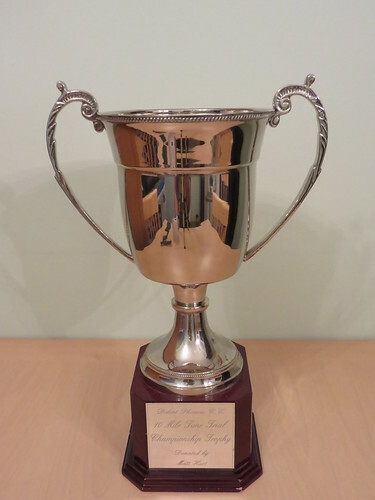 Points are awarded depending on the ranking of the event and this trophy is presented to the lady who gained most points in the Audax Calendar during the season. BEST ALL ROUNDER (B.A.R.) This trophy is to be awarded to the lady with the fastest average mph over 2 x 10, and 1 x 25 mile time trials. A D.P.C.C. club event time or time achieved in a C.T.T. open event is eligible for entry. Submit your times and relevant proof of performances for entry of this competition. 10 AND 25 MILE TIME TRIAL CHAMPIONSHIPS The club organises a 10 and 25 mile time trial championship for ladies (these are run on different dates). Check the current year club calendar for the specific dates of the two events. The winner is the rider in the ladies category who completes the course in the fastest time and the winner of each event will receive a trophy at the annual awards dinner. This trophy is to be awarded to any person breaking the 10 mile Club record and that person retains it until it is next broken. most successfully in road races. The decision is mainly based on points accrued through the season or moving up a racing category. THE HILL CLIMB TROPHY This cup is awarded to the rider who produces the lowest aggregate time in the 2 hill climbs in the club calendar. Check the club calendar for the dates. The two hill climbs can be run on the same day. SCRATCH CLUB TIME TRIAL TROPHY In the club time trial series, points are awarded for finishing position, 5 points for first, 4 for 2nd, 3 for 3rd 2 for 4th and 1 point for fifth. This trophy is Awarded to the club member who gets the most points. Best 14 scores to count. ROAD BIKE TIME TRIAL TROPHY Similar to the Scratch Trophy, This trophy is Awarded to the club member who gets the most points in club time trials on a road bike. Best 14 scores to count. DAVE’S CYCLO CROSS TROPHY This trophy is awarded to the rider the committee considers has competed most successfully in cyclo cross events between September and mid January. The decision is usually based on the number of points accrued in the Central Cyclo Cross League but results in other leagues and events may be given consideration. Due to the time of the cyclo cross season and the date of the DPCC awards dinner, a rider’s intention to be considered for this competition needs to be submitted promptly in early January. 10 AND 25 MILE TIME TRIAL CHAMPIONSHIPS The club organises a 10 and 25 mile time trial championships (these are run on different dates). Check the current year club calendar for the specific dates of the two events. The winner is the rider in the mens category who completes the course in the fastest time and the winner of each event will receive a trophy at the annual awards dinner. This trophy is awarded to the male club member who accrues the most Audax points during the current season as listed on the Audax UK website. “Brevet” or route cards from completed events, or other evidence of points tally, may need to be produced. The Audax season runs from October 1st to September 30th. WOMEN's AUDAX TROPHY As above but only open to female club members. VETERAN BEST ALL ROUNDER (B.A.R.) - LUPTON TROPHY This trophy is open to club members aged forty years or over. The winner is determined by mathematically correcting finishing times to account for the age of the rider. In this way a forty year old can compete directly with an eighty year old rider by removing the younger rider’s age advantage. The result is expressed as a “vets plus” time which is not easily explained in text to the uninitiated-ask a veteran club mate to explain it verbally or click here (Vets Standards). To enter the Lupton Trophy, as well as being over 40 years of age, you will need to submit your fastest time for 10, 25, 50 and 100 mile time trials and longest distance for a 12 hour time trial. SENIOR BEST ALL ROUNDER (B.A.R.) The Senior B.A.R. is awarded to the club member who achieves the fastest combined average speed across all of the following time trials. 10 mile, 25 mile, 50 mile and 100 mile distances. Entrants should submit their best performance from the current season for each of the 4 events. STAN MACIAK CHALLENGE The Stan Maciak Challenge is awarded to the club member that has participated and helped in the most number and diverse types of cycling events across the calendar year. The Trophy was designed, created and presented to the first winner of the 2015 season by Stan Maciaks son Shane. Each club member must register points claims through out the season as outlined here. FREEWHEEL COMPETITION The freewheel trophy is presented to the rider who travels the furthest distance from a standing start at the top of the appointed hill. The event is usually held on a Sunday and forms part of the club run route. The date is published via the D.P.C.C. website prior to the event and the current holder often suggests their choice of hill for consideration by the club runs co-ordinators. SYCOTTA CUP This cup is given to the club member (or members) who, in the committee’s opinion, have made an outstanding contribution to the club during the year and is a way of recognising and thanking one of the many volunteers within the club, without whom we would be unable to operate. CLUB RUNS Every time a rider participates in a club run, a point is awarded. The rider who accumulates the most points at the end of the calendar year receives the club runs trophy. The club runs co-ordinator’s decision is final.